My weekend was great! I got to see one of my favorite people this weekend…well actually 3 of my favorite people all at once which is rare! I helped host a baby shower on Saturday and I skipped lunch because I knew i would just end up snacking on foods there anyway – so I feel like I evened out there. I didn’t go overboard or anything. I also got up and met a new bike group near my house this Saturday morning. There were only 4 of us, and we ended up biking about 18 miles. It was a cloudy morning and we were nervous about rain the whole time, but we didn’t have any troubles. I felt like I could keep up with this new group, no problem. I even made a friend during the trip who said she would like to ride sometime outside the group – so that was cool. Not that I really have any more time in my life for additional rides, but hopefully she’ll be at the next group ride and we can chat. We had our cheat meal on Saturday night – enjoyed some Mexican food. I ordered the smaller version of my entree and I walked away feeling full, but not stuffed. Check! I slept in on Sunday and we made our first trip to the grocery store on our bikes. A few weeks back I found a free “pet buggy” to add on to your bike – and we thought it would be awesome to put groceries in instead. The store isn’t that far from our house, so we had a little adventure. It worked out nicely, and made us think twice about what we REALLY needed to buy since we my husband had to literally pull it home. Another plus – ice cream would be difficult to bring back since it’s pretty hot out already. A plus in the sense that I don’t have to deal with another distraction at home! We did a bit of house cleaning and played with the pups. Spent most the rest of the afternoon working outside on our little deck garden. Our plants are growing nicely. We even had a cute little neighborhood kid stop by to sell us tomato plant root systems – so we thought, why not! So now we’re hoping to have some home grown tomatoes this season. We cooked out some food on the grill and overall, had a pretty chill weekend. I spent some time getting my gym room all “ready” for my new workout program that I’ll start tonight after work. I have been working on pumping myself up for it all weekend. So i’m excited to start it, but nervous about the major commitment of 6 days a week. Today starts our summer schedule group exercise schedule, so I’ll be teaching TurboKick on Tuesdays now. So Tuesday will be my only day that i’ll HAVE to do 2 a day workouts. Hopefully I can manage! Overall, pretty decent weekend – I keep waiting for summer to start like it’s going to be a vacation when I know in reality – that will never happen again. 🙂 But a girl can dream! We found a free “doggy” carrier that can be attached to a bike a few weeks ago. We had been on the hunt for something like this so we could start riding our bikes to the grocery store as it’s only a few miles away. We finally made our first “trip to the store” today with our new pink buggy. It was a little scary and we decided to do some “structural upgrading” for next time. What can you do over the weekend to go the extra mile in your workout? It doesn’t have to be a crazy work out – just turn one normal thing into something that will burn more calories! So I’ve heard people talking about this topic on the radio shows I listen to in the morning (I literally switch in between 3 different shows every morning prior to arriving at work) and I never quite caught the whole segment any one place so I decided to look it up myself as the topic sounded interesting. It’s a list from Glamour magazine printed in ’97 that became wildly popular, so they just released a book about it with essays from women. This information has been re-posted from http://www.huffingtonpost.com/2012/04/24/turning-30-30-things-every-woman-should-have-and-should-know_n_1447368.html?ref=mostpopular. Since I’ll be leaving 30 behind in just a few months, I figured it might be worthwhile to review this list and see how I’m doing. Plus, if you didn’t notice, my blog title is 30Story – so it’s kinda a good fit. My responses to each item is in green font. Yes! I have this. The hubby and I have several pieces of new furniture we’ve picked out together for our home. Absolutely. I have several nice suits for the employer. And a few great dresses for when the hubby decides he wants to whisk me away for a surprise evening (still waiting for that one to happen! In his defense, he is simply terrible at keeping secrets in order to actually surprise me). Yes, yes, and yes. But I’ll put it out there that my suitcase is hot pink and I love it. I have a few juicy things – but I didn’t live on the wild side too much in my life…but I’m okay with that because I had a blast and those stories will be fun to re-tell. We have a savings account. I have a 401k and I hope that counts. Absolutely. Resumes are what I do for a living – so you better believe I have a good resume! I am blessed with many amazing friends that would allow me to do both all in the same session if i wanted. I’m doing good on this one, too . I hope it counts if my husband is the one who brought the power tools into the marriage. My bed frame was ridiculously expensive but I love it madly, truly and deeply. I believed it when I bought it, still believe it now. Hmm, I’m not sure i have a skin-care regimen other than – try to wash my face every night if i don’t get in the shower. haha But I do have a pretty legit exercise routine that is helping me plan for those “other facets of life” after 30. I’m good here on both accounts. I finally figured this one out a few years ago. It’s funny, even 5-6 years ago I wasn’t really sure how i felt. Now I’m 100% sure that I want kids. Okay…well at least A kid. Not so positive about the plural. Yes – i have experience doing all of these things. But i still dislike all of them. I’d say I learned my lesson about 20 fold on this one in my early to mid 20’s. I’d like to say I’m much better at this now. Hmmm, I know the secretary of state, and a nick name for my great grandmother on my mom’s side. Couldn’t tell you about my dads side because we didn’t really hang out with them very much. I sort of lose on this one, I don’t get things tailored hardly ever. But if i were to get something tailored I would know where to go. Yes. I got to do this for a small period of time in my life! Unfortunately, I’m aware of this. I’m not sure anybody knows their real limits until they are pushed, do they? Crap, I have a dentist appointment on Monday. They always lecture me about flossing. Last time, the lady told me I should floss in my car at stop lights on the way to work. I think that sounds a) gross b) crazy. Apparently, I’d rather not floss on a regular basis. It’s so boring. Yup. Learned a few times the hard way. I still need to work on this one. I’m excited to say I’m beginning to believe this in a lot of ways. I think my 30’s are going to be the best decade yet. So i guess I’m off to a good start. Maybe just a few things that i should work on apparently. But 30 has been pretty awesome so far, I’m assuming 31 is only going to get better. I’m ready. Recently, my husband and I decided we’d get serious about growing some herbs and veggies in our yard. We tried a few years ago and weren’t really successful. Most likely because we forgot to water them and you know – plants and herbs need water to live. 🙂 We just weren’t fully committed to the idea. This time – our herbs are flourishing for the most part. Actually, I should have taken a picture of our cilantro this morning because it is growing crazy-like (yes, that’s a word in my dictionary). I’m so excited for it to be ready for us to eat! It’s amazing what a difference it makes when you take a little time to do some research, buy the right materials and allow yourself some time to nurture the plants. I’m guessing that a few years ago, we weren’t really ready for a garden. Even just the few items we’re trying to grow now is a bit of effort. Bringing them in at night when it’s too cold, making sure they have enough water and sunlight. Researching to see when it’s time to move them to their own bigger space – it’s a lot to consider. But for whatever reason – it’s different this time. 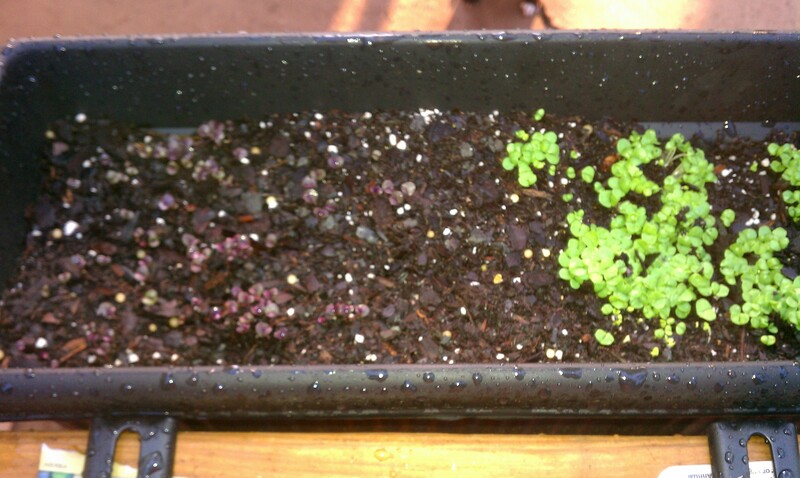 I actually care about the plants succeeding. I find myself stepping outside onto our deck where our plant boxes are hanging to check on all the plants almost every morning and evening. If I didn’t know myself, I would think that I actually sort of enjoy this venture into mini gardening. But seeing the work pay off and watching the plants grow is the ultimate success. I’ve actually never eaten a plant or vegetable that I (as in MY hands) helped grow. Weird, huh? So…right. This blog is not about gardening. And well, this post isn’t actually about the wonders of gardening either. This blog and this post are actually about making a change in your life. It’s eerily similar to gardening as I’ve described here. When you want something to HAPPEN in your life – making that decision is just the first part. But there is much more to actually bringing to life that decision – you have to do your research, you might have to spend some time and money to get the resources and materials you need to be successful. And you certainly have to believe that your investment of time and energy is worth the end result. Earlier this week, I challenged you to push yourself out of your comfort zone – pick something more intense to commit to for the summer months and GO! So this is how you get there. If you made that decision – this post is about the process of making your goal a reality. Now is time to start the real work. If you’ve selected something that you want to challenge yourself with – do your research. What’s it going to take? Do you need new shoes? Do you need to get some weights for your house? Do you need to join the gym or buy a video online? Figure it out and then do it. Next: this is also the time to start blocking off time for YOU to work on your challenge. You need TIME to do the hands on work that your challenge will require. Look at your schedule – figure out when you are going to fit this new thing into your life. I’ve already scheduled the next four weeks of my daily workouts on my calendar. Will I make every single one of them happen exactly as I’ve scheduled? Probably not 100% – but will it be easier to say no to doing something else that conflicts with my work out schedule because it’s ALREADY there? Of course. I would literally have to delete my workout from my calendar to put something else there instead. That helps me think twice about planning other things in my life. My workouts are on the calendar…so it’s almost like I come first. Wow. Life has a way of giving you obstacles no matter how motivated you are in the beginning. Expect the bumps, expect other people to not get you or why you want to do it. Expect there to be more tempting offers along the way of ways you can use your time. All of these things will happen. But if you can put the time into growing this decision into a real life action – nothing can get in the way of you seeing results in your own life. That’s a promise. I’m just as guilty as the next person of getting amped up and then losing my steam. That’s why I’m trying to do the hard work right now – mentally, so i can be in a good head place next week when the physical challenge starts. This is your journey, this is your life. It’s your body, your mind, your soul. What are you doing to help it grow into something you are proud of? Believe it – you are worth the time, effort and expense. What makes you push yourself harder than you ever thought you could? You know – those times in life where your whole body is just like “why are we doing this?” and you continue to give it all you’ve got. Then when you finish – you realize that you are SO much stronger than you thought you were. I’ve been preparing myself over the last month or so for a big self PUSH with my workouts. I was just waiting for classes to be over to get started with my new plan – I’m starting TURBOfire on Monday (this links to my beachbody page where you can check out details about turbofire if you want). Now – there are no more excuses and I’ll be starting my Summer PUSH Series next week. So, I was thinking – who else wants to be in on this with me? You don’t have to do the same program (although you can if you want – just ask me for details), you just have to come up with something that PUSHES you beyond your normal routine and out of your comfort zone. For some of you who are already working out – this may mean starting a more intense workout routine. For some who don’t really work out, this may mean incorporating 3-5 days of working out this summer. Not a runner? Being the Couch to 5k program and sign up for a 5k in August so you can train with a goal. Have access to a pool? Challenge yourself to swim several times a week. Work up to 45 minutes of swimming non stop. This is harder than it sounds! Interested in cycling? Join a local bike group to work on your endurance – almost every city has bike rides at a variety of levels! Already a member of a gym? Add strength training to your cardio workouts. Can’t afford a gym? Create circuits at your house and in your neighborhood with just a few types of equipment (set of dumbbells (7-10 lbs & a resistance band/tube would be a good place to start). You can utilize stairs, chairs, benches, hilly streets, you name it to get a great work out in. If you need some help putting an idea together – let me know. Want to work out at home? I have tons of programs to recommend. Ask me for a personalized recommendation – happy to help! So wherever you are – what can you do to PUSH yourself past your normal limits this summer? I am not expecting this PUSH Series to be easy – I’m going to need some major accountability from my readers, my real-life work out buddies, my husband, my friends, from strangers. 🙂 It’s going to be tough committing to SIX days a week of working out. Yeesh. And that’s just for this new program I’m doing. But I also have to allow for some of my regularly scheduled workouts to happen – you know, like that weekly class I teach 🙂 And I’d also like to be biking some this summer. So this is definitely going to PUSH me in ways I haven’t been pushed in awhile. For me, the warmer weather and the slow down in pace at work is always the best time for me to kick into high gear. I find I’m most successful at losing weight in the summer months. So this it is – next week, it’s on. What will you do to PUSH yourself? Share your plan with me and we can help keep each other accountable. My goal is to complete this 12 week program – and then get up the next day and do it all over again.